Chicago, Illinois has always been home to innovative architectural style. The skyline bears witness to iconic skyscrapers including the John Hancock Center, the neo-Gothic Tribune Tower and the Willis Tower, the tallest building in the world at the time it was erected. Arguably even more iconic is Cloud Gate, a sculpture in Millennium Park that captures the skyline on its reflective, bean-shaped form. Completed in May 2006, the stainless steel work of art now serves as a famous symbol of Chicago. Recorded as the third most populous city in the United States after New York and Los Angeles, Chi-Town has also left its mark on residential architecture. Following the Great Chicago Fire of 1871, which destroyed nearly all the wood-framed buildings and homes, the city was rebuilt on the brick and stone structures that stand today. The result, a city that has been able to withstand weathering better than most, while maintaining its classic look. This tremendous architectural heritage is evidenced in the stunning mixture of residential builds throughout the city, from Queen Anne, Italianate, Victorian Gothic, Neoclassical, Tudor to Prairie and Modern designs. Located in the Chicago Landmark District, is this traditional home that pays tribute to the Italianate style of the 1800s, donning a distinct limestone foundation and a red brick facade with zinc sheet metal cornices. 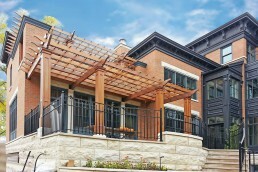 Designed by Kathryn Quinn Architects, the newly constructed house was a welcome addition to the existing neighbourhood, harmoniously blending in with the architectural features of the other houses on the block. 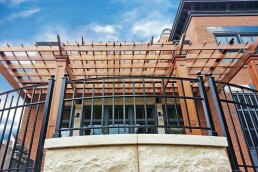 Also a welcomed addition, was the homeowner’s beautiful new pergola that stretches over the length and breadth of their outdoor patio space. 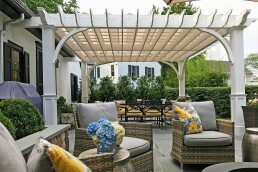 During the warmer months, the homeowners wanted to make use of this new outdoor space but needed a practical shade solution that wouldn’t take away from the stunning architecture of the pergola. 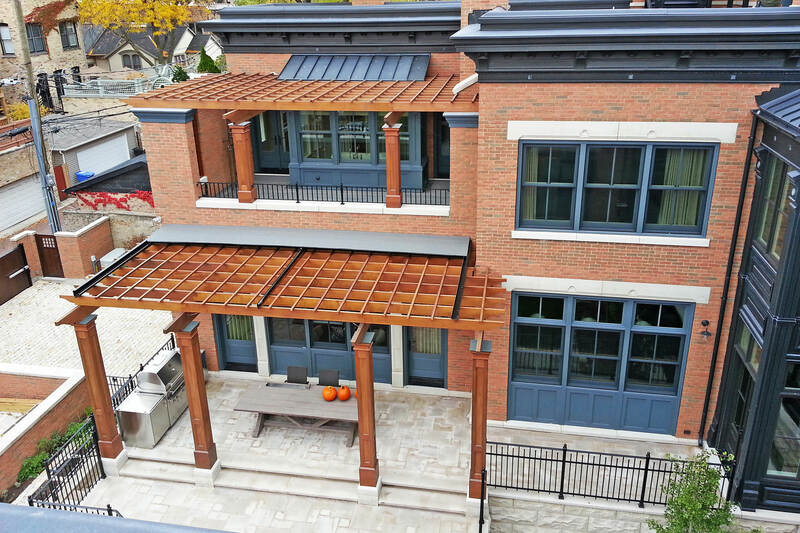 The homeowner engaged Evanston Awnings Co who contacted ShadeFX to explore retractable shade options. 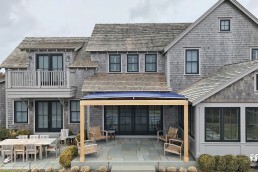 A 12×24 retractable roof was specified utilizing the Sunbrella Charcoal Grey fabric which blended in effortlessly with the home’s existing roof design. 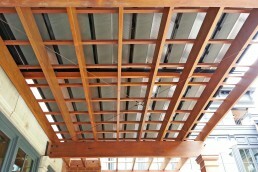 The retractable roof was selected because of its ability to be mounted on top of the structure so as to not hide the intricate features of the pergola. 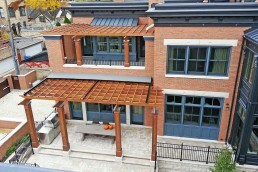 Being in “The Windy City” it was no surprise that wind sensors were added to this project, automatically retracting the roof under severe wind conditions. 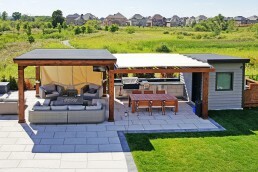 Now, whether raindrops or sunny days, these homeowners have a weather solution that allows them to spend all summer outdoors firing up the grill. 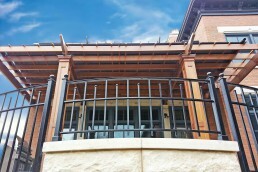 Contact us today to find out more about our sun and rain protection options. 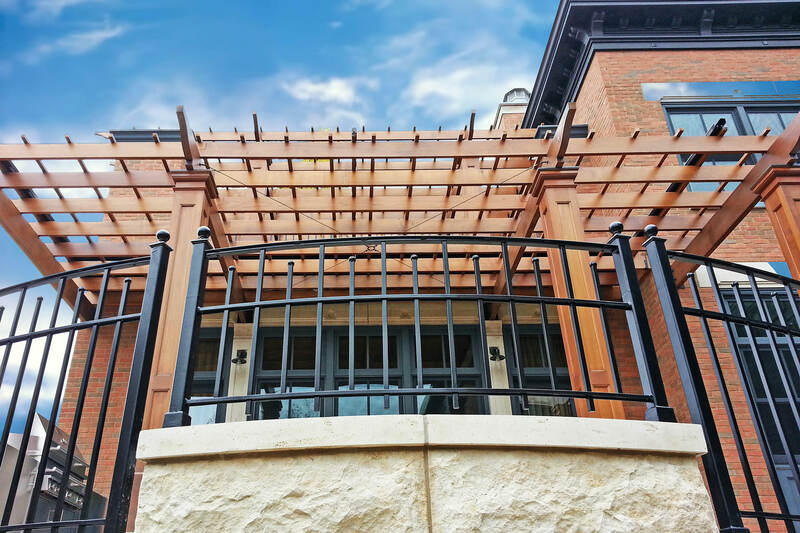 Paying tribute to the Italianate style of the 1800s, this newly built home in the Chicago Landmark District, needed a practical shade solution that wouldn’t take away from the stunning architecture of their pergola. A 12×24 retractable roof was specified utilising the Sunbrella Charcoal Grey fabric which blended in effortlessly with the home’s existing roof design. The retractable roof was selected because of its ability to be mounted on top of the structure so as to not hide the intricate features of the pergola.